Expertly crafted in 14k white gold, a cross within a cross is laser engraved on this Christian pendant necklace from Apples of Gold Jewelry. The cross pendant measures 33mm tall (including hoop / bale combo) x 17mm wide. In U.S. measurements that is approx. 1.29" tall x 0.67" wide. "For the grace of God that bringeth salvation hath appeared to all men" (Titus 2:11). 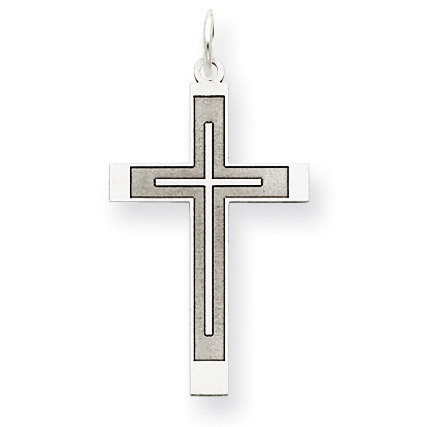 We guarantee our A Cross Within a Cross 14K White Gold Pendant to be high quality, authentic jewelry, as described above.